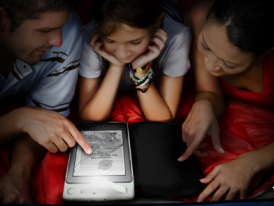 Joy loves having a reading light on her Kindle 4. Sure it’s great that you can read the Kindle’s e-ink screen in bright sunlight, but sometimes you want to read it under the covers. We bought the Amazon Kindle Lighted Leather Cover for $60. It weighs only 4.8 ounces, comes in four colors and works well. Then we saw the new Solar Lighted Leather Cover for Kindle, which costs $80. It has advantages and one disadvantage. The good news is it doesn’t obscure the right-side Kindle buttons the way the cheaper Kindle cover does. And it has its own battery instead of drawing power from the Kindle. It also has a nice button to make the light pop up into place. The bad news is it’s heavier: 7.5 ounces instead of 4.8, comes in four colors and works well.